Émile Édouard Charles Antoine Zola (French: [e.mil zɔ.la]; 2 April 1840 – 29 September 1902) was a French writer, the most important exemplar of the literary school of naturalism and an important contributor to the development of theatrical naturalism. He was a major figure in the political liberalization of France and in the exoneration of the falsely accused and convicted army officer Alfred Dreyfus, which is encapsulated in the renowned newspaper headline J’accuse. Zola was nominated for the first and second Nobel Prize in Literature in 1901 and 1902. 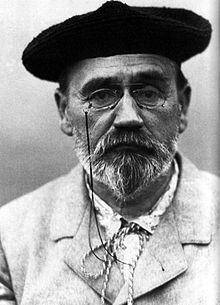 Zola was born in Paris in 1840. His father, François Zola (originally Francesco Zolla), was an Italian engineer. With his French wife, Alexandrine (Meley) Zola, the family moved to Aix-en-Provence in the southeast, when Émile was three years old. Four years later in 1847, his father died leaving his mother on a meagre pension. In 1858 the Zolas moved to Paris, where Émile’s childhood friend Paul Cézanne soon joined him. Zola started to write in the romantic style. His widowed mother had planned a law career for Émile but he failed his Baccalauréat examination. 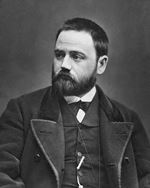 During his early years, Émile Zola wrote several short stories and essays, four plays and three novels. Among his early books was Contes à Ninon, published in 1864. With the publication of his sordid autobiographical novel La Confession de Claude (1865) attracting police attention, Hachette fired him. His novel Les Mystères de Marseille appeared as a serial in 1867.